by Claudine Chalmers. University of Oklahoma Press, October 2013. 272 p. ill. ISBN 9780806143767 (cl. ), $45.00. In this richly illustrated, engagingly written volume, California historian Claudine Chalmers brings to light an important aspect of nineteenth-century American visual culture. 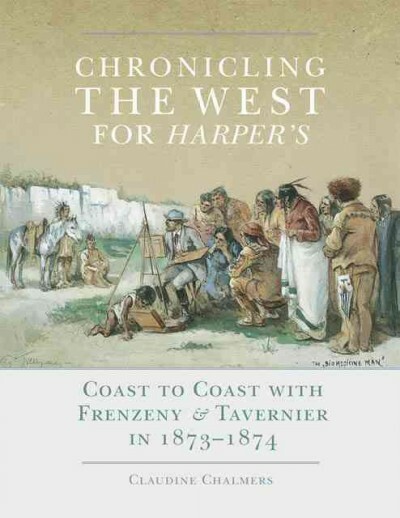 Chronicling the West for Harper’s: Coast to Coast with Frenzeny & Tavernier in 1873-1874 gives a brief introduction to the development of the illustrated newspaper and the rise of the “special artist,” a type of correspondent whose technical skill and acumen for social commentary must be matched by a flair for the dramatic and a sense of adventure. In Paul Frenzeny and Jules Tavernier, Harper’s found an ideal pair of “special artists” to sate American’s growing appetite for Western exploration with sophisticated European artistic training and a fresh perspective. In the following thirteen chapters, Chalmers takes the reader chronologically along Frenzeny and Tavernier’s route. Each chapter offers richly detailed historical background and careful description of each of their 100 illustrations, although one often wishes for more developed visual analysis. Chapters one and two set the stage for a romantic vision of the untamed Western frontier with gritty depictions of industrial epicenters New York and Pittsburgh. In the subsequent chapters, Frenzeny and Tavernier take the M.K. & T. or “Katy” line to Hannibal, Missouri, a major hub for the rapidly developing railroad, and begin to elucidate the artists’ vision of the West as a wholesome antidote to crowded and dirty Eastern cities as they continue on through the Neosho Valley of Kansas. Chalmers details their entry into the “Indian Territory” of Oklahoma and finds the pair at the railroad’s western terminus in Denison, Texas, a mere two months after setting out. An entire chapter covers the Texas and Kansas cattle trade. Frenzeny and Tavernier take the Atchison, Topeka and Santa Fe railroad into Colorado, offering a glimpse of Rocky Mountain mining and boom towns, trout farming, and hunting. The artists then diverge for the end of the journey; chapter eleven covers Tavernier’s encounter with the Red Cloud Nation and the final two chapters follow Frenzeny as he continued on to Salt Lake City and San Francisco. The well-made volume reproduces each of the 100 plates with their original captions and contains an appendix listing each illustration chronologically, as well as a fruitful bibliography of both primary and secondary sources. Although the book reads almost like a popular history work, Chalmers’ research is well-documented and she makes a strong case for these illustrations as a critical vehicle for visualizing the West in the popular imagination. Recommended.